Photographs and articles on Facebook have been re-circulating recently about the "inhumane" and "sickening" Faroe Islands whale hunts. After re-posting my original blog post written the day after my own experience in the Faroe Islands, I started thinking about my time in those small islands and realized I hadn't revisited my photos in a long time. I visited the Faroe Islands in May of 2011 for a photo story I planned to do about the whale hunt. Because hunts are not planned, I decided to do a larger focus on the culture of the Faroe Islands. The thesis of my project was centered around a nickname for the Faroes, "The Land of Maybe." The nickname comes from the difficulty of traveling and planning between the islands, as weather conditions are often harsh — the Faroes are located between Ireland and Iceland — and can leave plans a little up in the air, as you'll never get anywhere quite on time. When I went to the Faroes, I stayed in two places — Torshavn, the largest city in the Faroe Islands, and Klasvik, the second-largest city. "Largest" is a generous term — Torshavn is made up of 13,000 people and Klasvik is home to less than 5,000. This is not surprising, as the entire country, a nation under the kingdom of Denmark, houses around 50,000 people total across its 18 major islands. And the Faroe Islands are a magical place and perhaps one of the most beautiful places on earth. The islands — massive, lush green mounds — jut out of the North Atlantic Ocean, hidden under constant fog. The houses that dot the seaside are colorful and simple — similar to Cape Cod style houses, in bright reds, yellows and greens. And even though the Faroe Islands are beautiful, its weather is not for the faint of heart. It is cold there almost year-round and sees constant misty rain, leading to a lack of tenable livestock and not much room for agriculture. Sheep are the only livestock that can manage the climate, and rhubarb and potatoes are about the only plants hearty enough for the country. One of the biggest industries in the Faroe Islands is salmon farming. Which leads us to the whale hunting tradition itself. 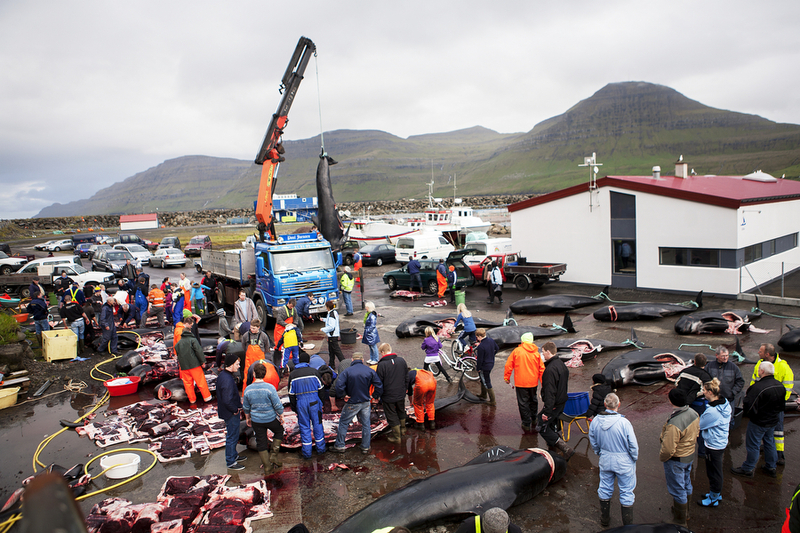 Whale hunting was borne out of a necessity — the Faroese find their sustenance in the water. Whales are not hunted in season as there is no cap on the amount of pilot whales that can be hunted. It is not a planned event, either — a local townsperson will spot a pod of traveling whales close to shore, and alert the grindaformenn, who assembles the usual trained team of people who go out on the "grindadrap" — the whale hunt. The men herd the pilot whales into hunting-approved beaches in boats. The beaches must be shallow enough for this step, otherwise it can be difficult to slaughter the whales easily and humanely. If this cannot be done, the hunt is abandoned. Once the whales are herded, the hunters use a tool to slice the spinal cord of the whale through the blow hole, which takes less than 20 seconds. It kills the whale within seconds, and causes little pain. The actual hunt takes less than 20 minutes, and this is why I did not actually see the hunting process myself. I saw all the aftermath — the sorting of the meat and the clean-up. I thought this was the most interesting part, as it really showcases the large act of the community that comes together for this hunt. Townsfolk are often allowed to leave work early to go help with the hunt, and kids are encouraged to take part to learn the tradition. However, the hunt is not a "rite of passage" for young boys. This is often said and is untrue. People of all ages and genders take part in the hunt and it is not some tradition of manhood — it's mostly just about food and community and resourcefulness. Although this hunt was two years ago, it continues to be one of my favorite stories, one of the favorite places I've ever visited, and one of the most amazing things I've ever been a part of. It was beautiful watching a community come together to help feed each other in one of the most beautiful places on earth. And even though it's been two years, this continues to be a very passionate topic to me — not just whale hunting, but all meat consumption. I feel that much of the outrage over the photographs seen of the whale hunt, with no context, comes from a lack of knowing how meat gets to your table. I've been to large-scale beef factories, watch people kill turkeys and chickens with their bare hands, witnessed the process of dressing a deer. I feel that most people are so removed from their food that when they see bloody, red water, they don't think that that's just a part of death, and don't realize the life of an animal is the byproduct of their dinner. I continue to support the tradition of the hunt in the Faroe Islands because I believe hunting animals in the wild is the most humane method of meat consumption. These animals are killed quickly and done so without having ever spent any time in captivity, which cannot be said for most American feed lots, where cows are crowded and sinking in the mud. I do so also because, as of right now, pilot whales are not an endangered species, but, according to the Faroese, are plentiful and can be seen often. This is another misconception when it comes to discussing whale hunting. I think of my time in the Faroe Islands fondly. 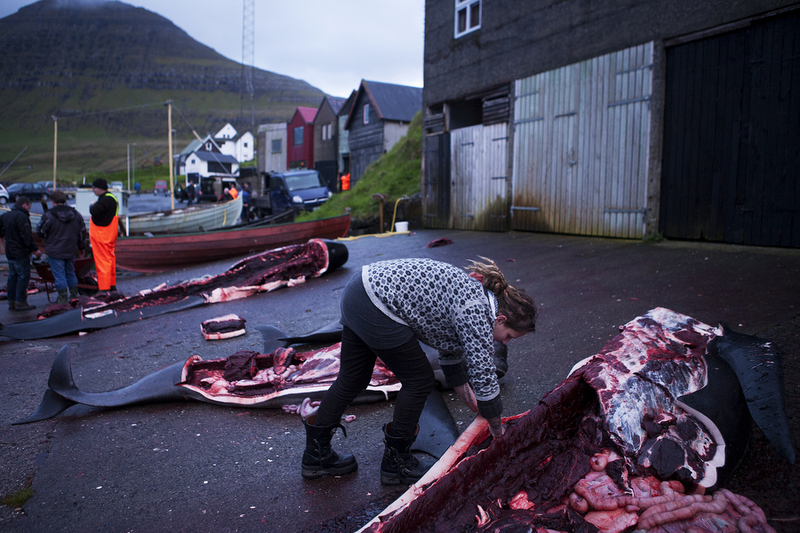 After everyone finished sorting the whale meat, my friends and I — Frihild Holmsund and Sari Lesch — filled up trash bags of leftover meat before the whale carcasses were put back into the ocean and loaded the bags into our small loaned hatchback. Before we left, we had waffles with a family who lived near the cove overlooking the beach where the whale hunt took place – a hunting tradition, they said. And the next day we ate boiled whale meat and, the next day, a whale stew. And who knows after that — I'm sure Frihild had meat for months. And it was a great feeling, as those meals had a sense of accomplishment — because we knew where the meat had come from, we knew it was fresh and we worked to get it on our table. The small village of Gjógv is nestled in a valley in the mountains of the Faroe Islands. Many villages, such as this one, are home to no more than 100 people, often from the same family unit. This particular village has no grocery store or gas station — its only buildings that are not houses include an old church and an indoor fish farm.